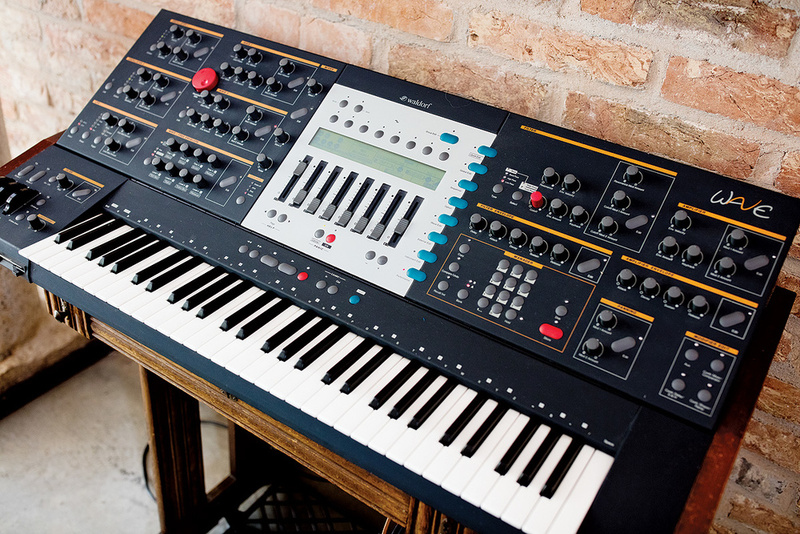 Studio A combines the functions of live room and control room in a single space. Some recording studios are housed in purpose-built structures, while others adapt pre-existing buildings. Both options have their pros and cons, and although purpose-build studios can be tailored to exacting acoustic specifications, what they inevitably lack is a history that pre-dates the studio’s own business. This is not a criticism you can level at Bavaria’s Altes Elektrizitätswerk. As a recording studio it is fairly young, but the history of the compound dates back to the Middle Ages. 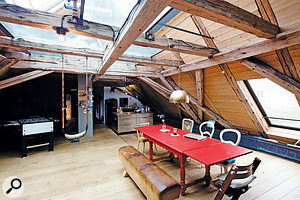 In fact, in terms of the building, this might even be the oldest recording studio in the world! Installed in an old water mill, the studio’s name translates as “old power plant“, giving a clue as to one aspect of the building’s history. Part of a group of buildings around a medieval castle built by the Duke of Abensberg, which was mentioned in public records as early as 1256, the building was a sawmill for hundreds of years, before the city of Abensberg — halfway between Ingolstadt and Regensburg and only half an hour away from Munich airport — acquired the premises in 1899 to convert them into a power station. Around the same time, a public outdoor swimming pool was opened, and remained in use well into the 1960s. The watermill still generates power for almost 40 households, but in 2003, work began on adapting the building for its current use: as a recording studio owned by Christian Lohr, a multi-talented keyboardist, songwriter, producer and engineer with a long track record. Lohr graduated from Berklee College in 1994 with degrees in piano and music synthesis, and embarked on an international career with stints in Munich, New York and Los Angeles. He has worked as a keyboard player and/or musical director with Mick Jagger, Paulina Rubio, Gianna Nannini and Joss Stone, and today divides his studio time between Berlin and Bavaria: his two studios have almost identical technical setups. 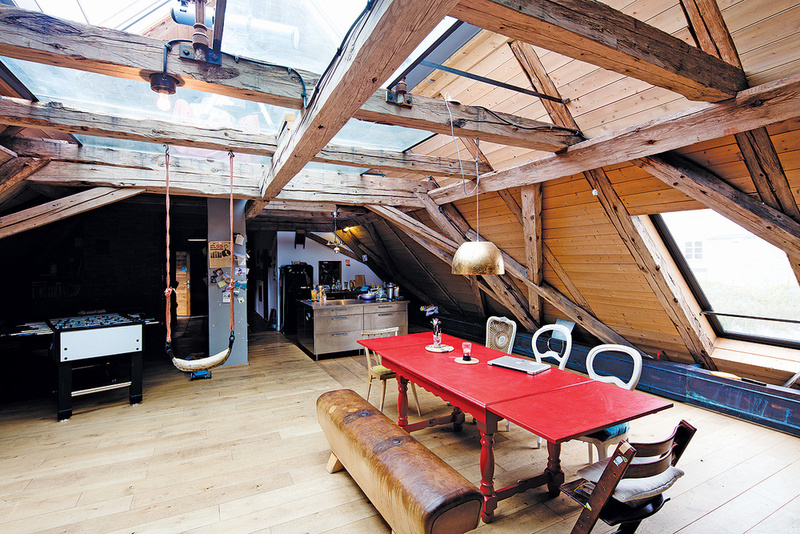 The first-floor Studio B is designated the ‘wood room’, for obvious reasons! Rare keyboards at Altes Elektrizitätswerk include this Moog Memorymoog... ...and this Waldorf Wave. Among the outboard in Studio A’s combined live and control room are a Teletronix LA-2A compressor, a Chandler Limited TG2 preamp, and a vintage Klemt Echolette. 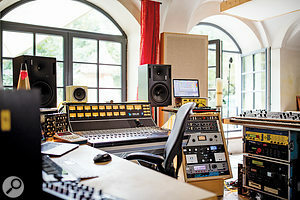 The studio’s stunning location has made it the destination of choice for numerous artists and producers.The conversion took place in stages, and was finally completed in 2006. 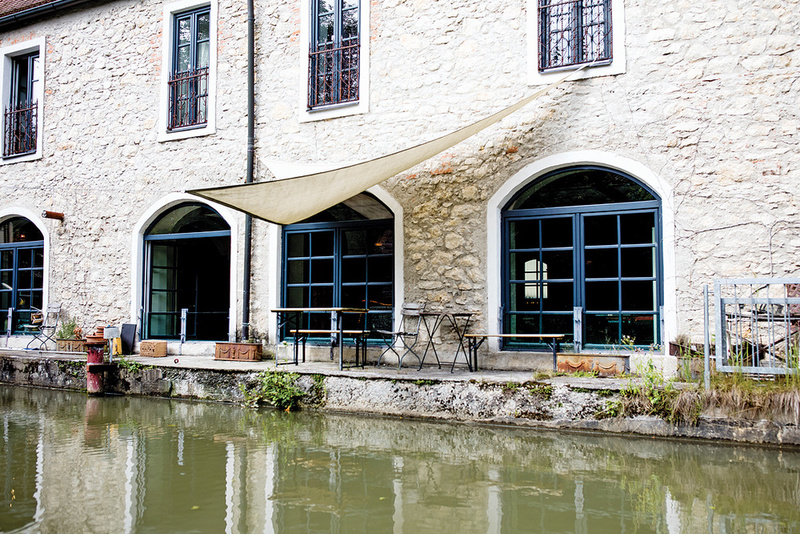 Today, the mill building is home to the 200-square-metre ‘stone studio’ Studio A and the smaller ‘wood room’ Studio B on the first floor, as well as several recreational and residential spaces, including a large loft area under the roof and four guest rooms. The construction process was overseen by Jochen Veith of JV Acoustics, who designed Studio A as an open-plan space with no acoustic barrier between the control and live areas. 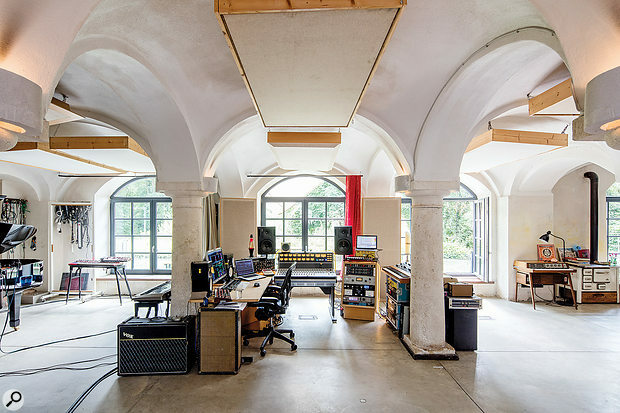 Christian Lohr prefers the direct communication and the seamless creative process that such an environment facilitates, and he cites Peter Gabriel’s Real World Studios (SOS May 2017), also based in an old watermill, as a role model. The studio includes several zones with different acoustic properties — some with a dry sound, some livelier — and a designated mixing area. The concept has proven successful, with Studio A having hosted recording sessions where Joss Stone and a 10-piece band played live together in the open space, with only the amps locked away in iso booths. The mill stream, passing directly under the studio windows, and the south-facing terrace help to make it a unique and inspiring environment for creating music. Rather than installing a single large console, Lohr chose to employ two smaller consoles — an API 1608 and a Neve BCM10, with 1073 channels — to extend the sonic possibilities. 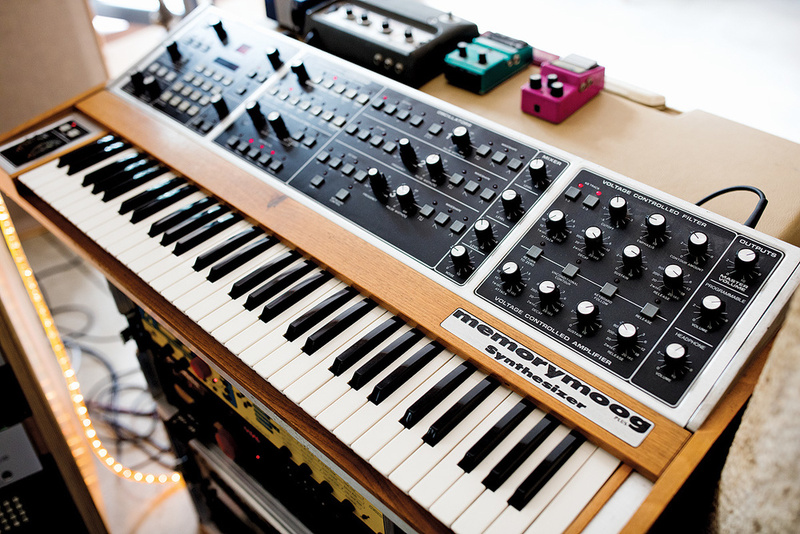 The desks are complemented by a number of outboard processors including a Teletronix LA-2A compressor, a Chandler Limited TG2 preamp, and effects units like the vintage Klemt Echolette, a German tape delay based on tube amplifiers. The studio was conceived above all as a writing and recording venue, and Christian Lohr has an incredible collection of instruments and amplifiers at his disposal. There are several Ludwig drum kids from the ’60s and ’70s, plus a huge collection of snares that includes marching drums from Napoleon’s time. The keyboard and synth collection includes a beautiful Yamaha grand piano, a 1959 Hammond B3 with Leslie 125, two different-sounding Wurlitzer 200As, a Memorymoog, Minimoog retrofitted with MIDI, a rare Waldorf Wave, the king of wavetable synthesizers, a Korg MS-10 and a Yamaha VL1 physical modelling synth, as well as a vintage Philicorda tube organ and an 18th Century harmonium. The first sessions that took place at the studio saw Christian Lohr work with Gianna Nannini on her 2004 album Perle. Since then he and the studio have gained extensive writing, recording, production and mixing credits, and the space has always been open for outside clients as well. The list of artists includes names such as Sting, Donna Summer, Söhne Mannheims, Alphaville, Andrea Bocelli, Gregory Porter, Helene Fischer, Ute Lemper, Gitte Hænning, Howard Carpendale, Adoro, Gregor Meyle, Hellmut Hattler, Matthias Reim, Mia and Saint Lu, to mention only a few.